These lemon meringue nests from My Sweet Remedy are a festive treat to serve at your Easter celebration. The nest is made by piping meringue in a circular mold and baking it. 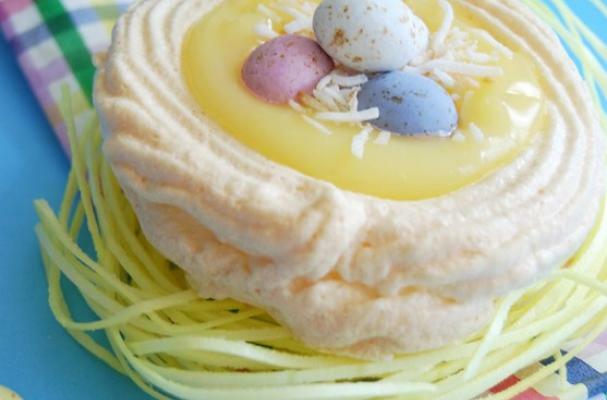 Each meringue nest is then filled with homemade lemon curd and topped with shredded coconut and chocolate eggs. When making meringue it is very important to not mix any egg yolks with the egg whites. If any fat is present, the egg whites will not form into stiff peaks (this also means using a clean bowl). Lemon meringue nests are sure to be a hit with kids and adults alike.